This months Recipe Redux theme is vintage side dishes. It took me a little while to come up with a dish to do as I come from a long line of Southern cooks and the options are many. Casseroles are a mainstay in their repertoire and one of my favorites at all of our holiday gatherings is Broccoli Casserole. My aunt now makes it for our gatherings as my grandmother at 95 doesn’t cook anymore. Several years ago I had asked my aunt for the recipe, which as I suspected, was laden with mayonnaise, cheese and cream of mushroom soup, not to mention topped with crumbled cheese crackers. It has been on my to do list for a while to play with, so naturally it was on the short list for this month’s Redux, and eventually ended up winning out. Instead of mayonnaise, I used plain Greek yogurt and mashed avocado. Yes, avocado! It adds a nice creamy texture, not to mention heart healthy fats to the dish. You could easily use olive oil mayonnaise in place of the avocado or more yogurt if you’d rather. The cheese crackers are replaced by a thin layer of panko breadcrumbs and some reduced fat cheddar cheese. My whole family enjoyed the end result. We’ll see what the extended family thinks tomorrow for Thanksgiving! I hope everyone has a wonderful Thanksgiving. I’m thankful to be surrounded by a wonderful family full of good cooks and look forward to our feast tomorrow. 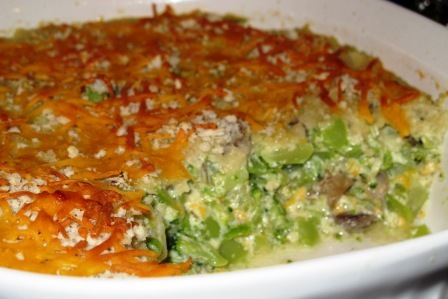 This month's redux of vintage side dishes is a healthier spin on my family's Broccoli Casserole. Spray a 2½ quart casserole dish with cooking spray and preheat oven to 350 degrees F.
Melt butter in a large sauce pan. Add onions and garlic and saute until soft, about 3 minutes. Add mushrooms to pan and continue to cook until soft, about 5 minutes more. Add flour, stirring well. Gradually add milk and continue to stir to combine. Simmer until thickened, stirring often. Remove from heat and add ¾ cup of the cheese, stirring until melted. Set aside and cool slightly. In a bowl, combine eggs, yogurt and avocado. Add to cheese sauce and stir well. Season to taste with salt and pepper.